BUILDING FUN; Make crazy self-standing builds by weaving the pipes through existing cut-outs on the bin. 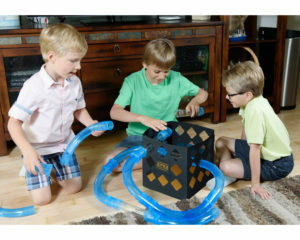 USE AS STORAGE ; When playtime is over, use Zipes® Crazy Cube as a storage bin. USE AS A FLAT BANNER ; bin unfolds to flat banner that can be hung for creating off the ground Zipes® Speed Pipes crazy builds. 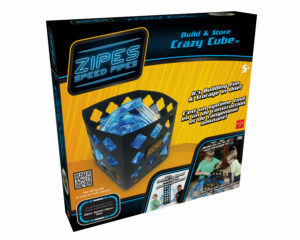 Zipes® Crazy Cube™ is building fun and storage all in one! Make crazy self-standing builds by weaving the pipes through existing cut-outs on the bin. 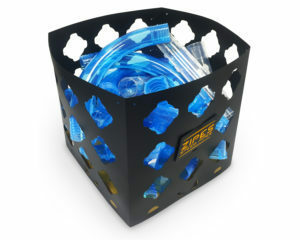 When playtime is over, use Zipes® Crazy Cube as a storage bin for the Zipes® Pipes, racers and remotes. The bin unfolds to flat banner that can be hung for creating off the ground Zipes® Speed Pipes builds.